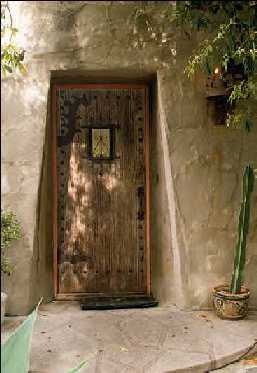 This story originally appeared in the Fall 2006 issue of American Bungalow magazine. Slide show photos by Alexander Vertikoff Photography. Perched atop a hill next to Elysian Park, Robert Stacy-Judd’s Atwater Bungalows combine the features of a Pueblo Indian kiva with the fantasy of a Hollywood stage set. 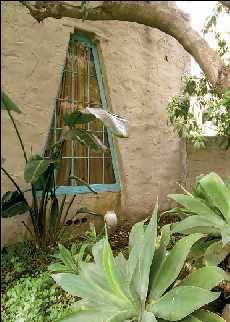 The two bungalows are built of thick, unfinished stucco, with Pueblo-style windows, doors, stairways and other features. The story of the Atwater Bungalows begins near the turn of the last century. 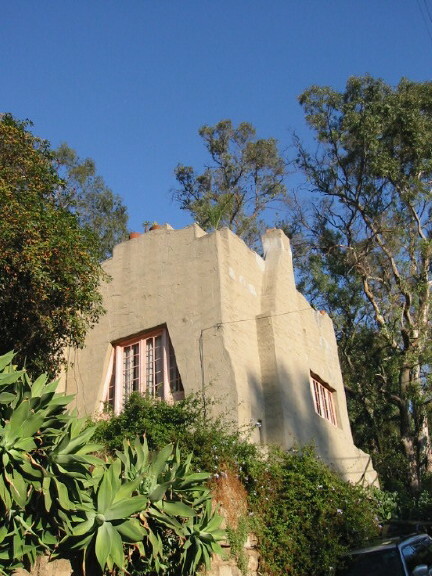 Sometime around 1910, ten years or so after he began a dentistry practice in Los Angeles, Dr. H. Gale Atwater and his wife, Beulah, began buying up what eventually amounted to more than 20 lots along sloping Avon Park Terrace, high atop one of the many steep hills of Echo Park, an area adjacent to Elysian Park, northeast of downtown. Echo Park had been the site of the city’s first housing boom, in the 1880s, and later was the first seat of the Southern California movie industry. The Atwater family home soon rose near the top of the property. But Dr. Atwater, described by his grandson, 67-year-old Ronald Atwater, as “a Socialist and a peacenik” with an apparent penchant for exotic architectures, wanted to continue building. He had developed an avid interest in Native American culture, perhaps influenced by Charles F. Lummis and others who had begun promoting American Southwest indigenous culture in the latter years of the nineteenth century and the early years of the twentieth. The Atwaters’ financial concerns were heightened when construction was completed in 1931 and they were hard pressed at first to find tenants who could afford the rent. In time, though, the striking buildings became highly desirable places to live for those who appreciated their odd charm. Although they have different floor plans and different details, both are spacious, with full dining and living rooms, three bedrooms, and two bathrooms with their original tile intact. In the Los Angeles of the 1920s, Dr. Atwater wasn’t alone in his fascination with unusual architectural styles. 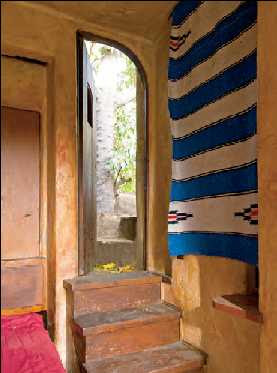 Native American and “Hispanic/Mediterranean” motifs were finding “a warm and appreciative audience” in the region, Gebhard wrote in Robert Stacy-Judd: Maya Architecture and the Creation of a New Style.The mid-to-late 1920s were also the heyday of interest in Meso-American archeology and the idea that Native American styles could be the basis for a new all-American architecture. Proponents of the Meso-American (or pre-Columbian) style viewed it as a welcome return to the folk-like and primitive, and Stacy-Judd became a prominent exponent of the Meso-American idiom. Stacy-Judd was born in London in 1884. His first architectural commissions were in England, where he designed homes and hotels in the Beaux Arts style that was popular in the early years of the twentieth century. He emigrated to the United States in 1914, settling and working in Minot, North Dakota, until 1918, when he moved to Alberta, Canada. Gebhard continued: In the planning of the “modern” (including, of course, the bungalow) he argued for informality, for combining living and dining spaces into one room, for providing sunny [ideally facing towards the east] breakfast nooks off the kitchen, and for laying out the basement so that it could provide space for a family gaming room. 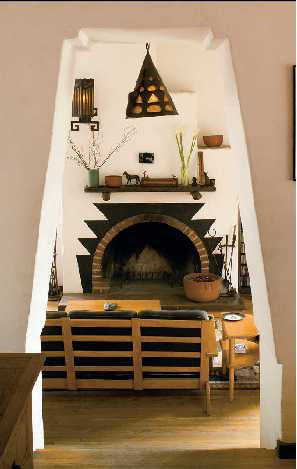 His observations about eliminating interior details which “are breeding grounds for unwelcome germs and a remarkably effective resting place for dust,” [are] similar to the puritanical arguments of the early California modernist, Irving J. Gill. 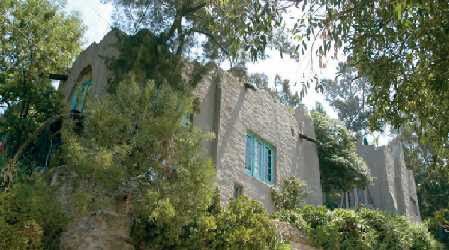 Stacy-Judd designed “Californias” and other homes when he moved to Los Angeles in 1922. His most famous commission, however, was not a residence but a commercial building—the Aztec Hotel, built in the city of Monrovia and completed in 1925. The hotel, which is currently being restored, was designed in a Mayan style, which Stacy-Judd touted as the logical form for twentieth century architecture. A flamboyant publicist and showman as well as an architect, Stacy-Judd wrote and lectured about Mayan architecture and traveled to the Yucatan jungles to explore Mayan pyramids. By 1930, public interest in both Meso-American architecture and Stacy-Judd had waned. 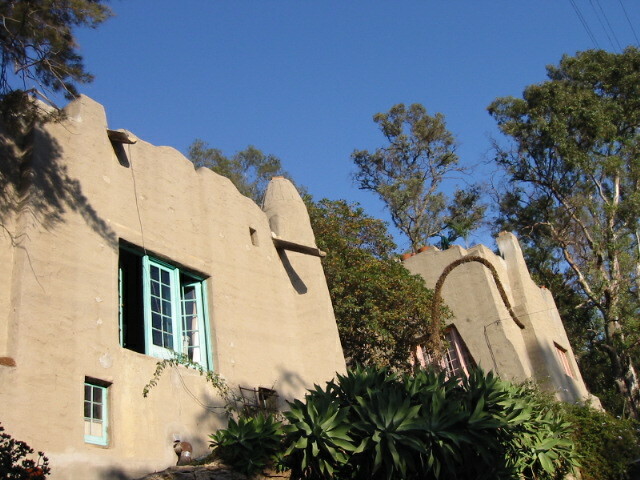 But his writings and lectures, and his Aztec Hotel in particular, had captured Dr. Atwater’s fancy, and the dentist commissioned him to build two more Hopi-inspired homes on the Avon Park Terrace property. He could not have selected a more appropriate person for the job. The bungalow at 1433 Avon Park Terrace is on the lower part of the hill, while the adjacent bungalow, at 1431, is at a slightly higher elevation. 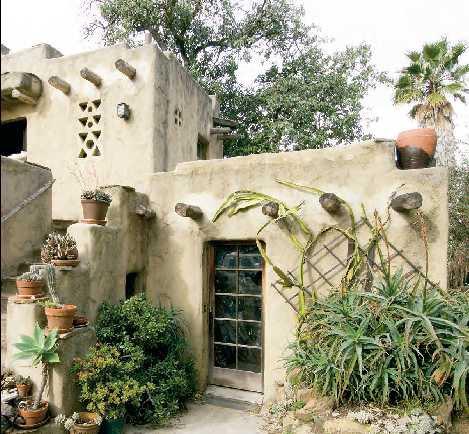 The hill continues to climb eastward to the end of the street, where a dirt driveway leads to the Atwater family’s former residence and a one-unit apartment building— yet another Hopi-influenced project—designed by Ronald’s father, the late Eugene Atwater.